I'm such a laid back person when it comes to holidaying. I'm not bothered by looks of a building, or age of the decor - if it has a comfy bed, a hot bath and is clean, then it's all good with me. I don't look for an apartment like I'm house hunting. It's not my home, I wont be spending much time there and I don't need it to have all the luxuries I get at home to get by. It's our base. A place to sleep, and wash, and leave our cases - that's it. You know what else I want from an apartment? A good pool and a good location. It doesn't need to be flashy with bells and whistles, I'm happy with a place for the kids to play and a location which means we are surrounded by places to visit. So, here is the low down on how we booked. September 2017, I checked on On The Beach and saw that the holidays were at a great price at that moment in time (as they are for next year too if flying with EasyJet). I knew just how much holidays can change almost over night, so my husband and I took that opportunity to book for April 2018. We initially wanted a week in the sun. I wasn't too bothered where, as long as it had some places that even the fussy T would eat at, a nice beach and a good location to have places to visit. We went for Benidorm. The town centre there has numerous shops, bars and restaurants and Levante beach which stretches from one end of the resort to the other with plenty of water sport activities. And if you book the Rincón de Loix end, you're away from the noise and the clubs, and are in the apartment and more family-friendly area. The Europa Center Apartments are in the centre of this area of Benidorm. All apartments are basic but spacious, providing good value for money and equipped for up to six guests in the 2 bedroomed apartments, which we stayed in. Our apartment had a furnished balcony (which had the option of pulling the windows fully along and closing the whole thing in), a full bathroom and kitchen. 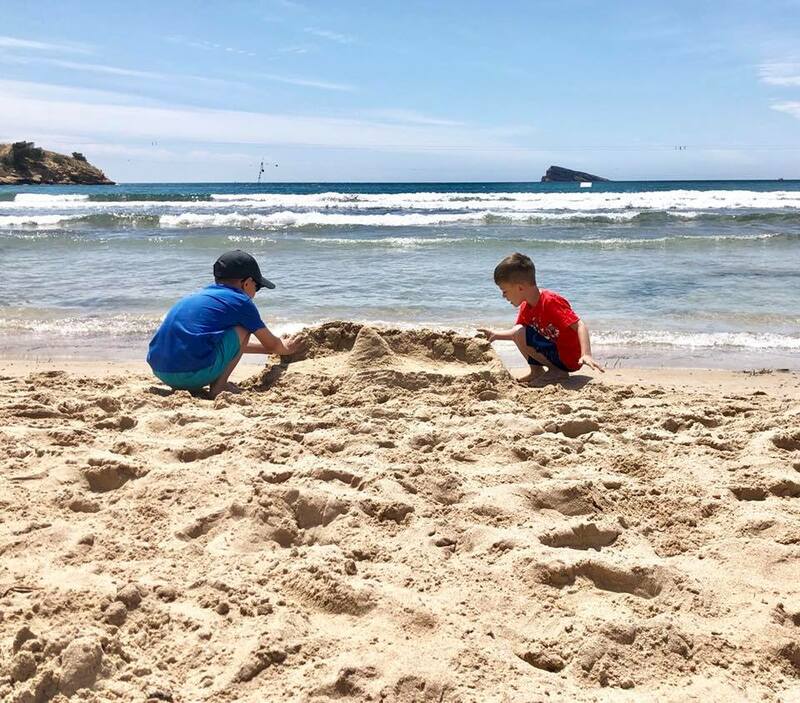 And even though it's in the quieter end of Benidorm, it's within easy walking distance of the nearby restaurants and bars and down the street from the beach. Benidorm is known for 2 things - elderly holidays and clubbers - and I think that is what puts off a lot of people from booking. But it's not at all. 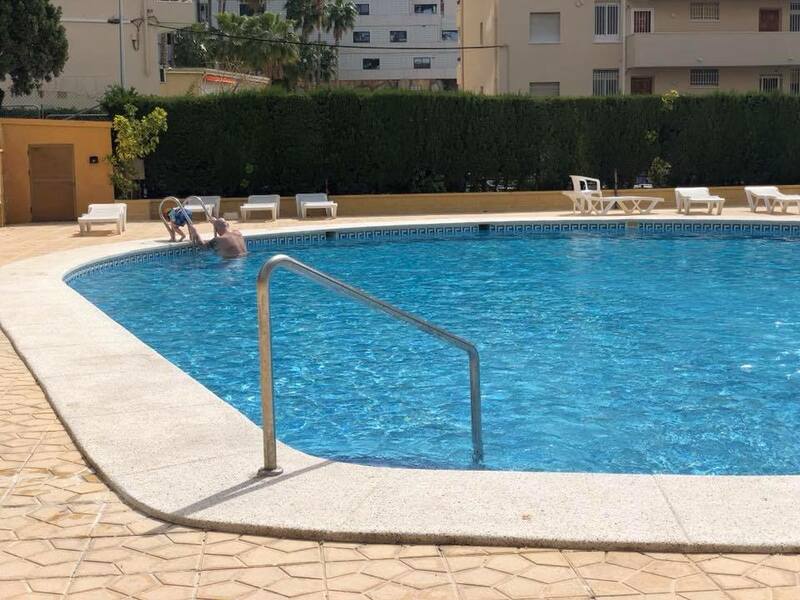 There is one strip in Benidorm, right away from these apartments - about a 10/15 minutes walk away and this area can be loud and have adult only hotels. But the area we stayed in is such a family-friendly side, and so quiet too as these apartments don't allow large groups or stag/hen parties. Most don't at this side of Benidorm which means that kids, and us parents, get a good nights sleep. Literally a 3 minutes walk from the beach, I know as we timed this, was our apartment. There are a handful of British bars and restaurants around as well as all the major fast food places too (FYI, Spanish McDonald's is nothing to write home about!). There are Chinese buffets, and Indian Restaurants. In fact, the only thing there isn't much of, is Spanish restaurants. 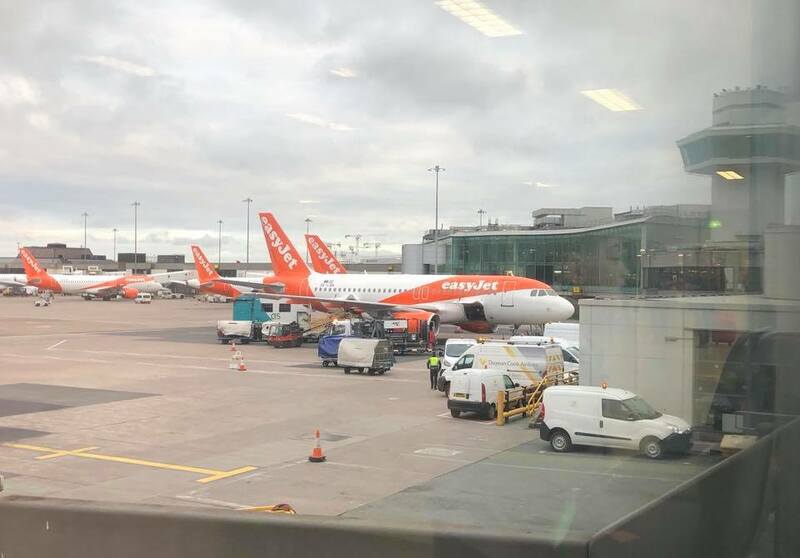 So, anyway, we flew on the 23rd April, flying with EasyJet from Manchester. We live closest to Leeds and Bradford Airport but it's cheaper for us to travel to and fly from MAN. A very early morning flight and let me tell you, Manchester Airport, Terminal 1, is rubbish for breakfast. There is a restaurant upstairs, but as you can imagine with the amount of flights going through, this place was packed. There was no space for us to sit there, so we had to go downstairs to find something. The only place was Burger King, who were serving chips and burgers at 5.30am. We boarded the flight and it took off with no delays and were up in the air in no time. And now is probably the right time to mention that I am petrified of taking off, so as you can imagine, having C with his anxiety disorder, J who was crying (as the security in the airport wanted to scan his blanket, and he doesn't like anyone touching his blanket) and me all in one row was pleasant. Eventually everyone settled, and actually I was really surprised how well C did. The noise, the new place and the plane didn't seem to faze him at all. The flight was smooth and the kids were perfect throughout, even when landing, although this was when T suffered with his ears popping. We came in to land and the heat hit us instantly - bliss! Security in Spain is fine and we had our cases and were onto the transfers in no time. Our transfers were with Jumbo Transfers and took around an hour to get there - might have been less but I was too busy staring out the window to care about time! And then we were there! The thing about booking the Europa Center Apartments is that they don't have a manned reception, so you need to pick your keys up elsewhere. At night this is at another hotel, but during the day it's at a rental place next to the beach - maybe a 5 minute walk away. I went to pick the keys up whilst the husband and kids stayed at the bar and had a drink. Can I just say right now, that I rate Europa Center and their customer service so much - they were amazing throughout our holiday. The day after we arrived, my parents flew out - they were also staying at the same place. They had a problem with their boiler, it kept cutting out. Within the first day, a new boiler was brought out and replaced - it's not often to see speedy work like that! Back onto our holiday. The Europa Center is a quiet apartment block. A lot of the apartments are owned by Spanish residents so it's peaceful. This also means that the pool is quiet. So quiet. Most of the time, it was just us and another group of holiday makers around the pool. And it was vast. It had showers at the side of it and toilets too, and the whole area was gated so only people from the apartments could get in, and no sneaky children could get out. The restaurant downstairs is fab, such a friendly bunch - and if you ask for their WiFi password, it will keep connected whilst you're in the apartments (we were on the first floor and could connect but my parents were on the third and could connect on the balcony). 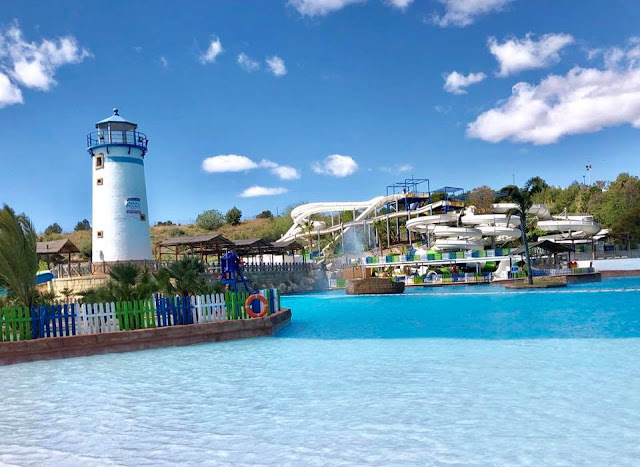 There are even a plethora of water parks around Benidorm. 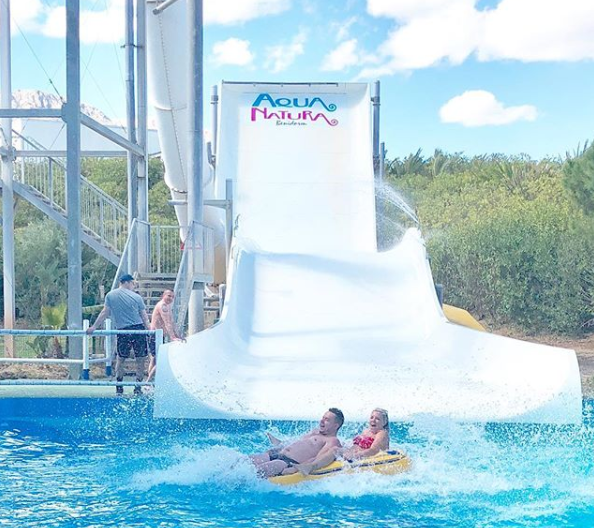 We visited Aqua Natura which was amazing. Plenty of slides and pools for the kids, and food that weren't too expensive as is usually the case at most theme parks. The biggest slide there, La Cresta, didn't open till the afternoon and looked very scar indeed. In fact, they had to have a defibrillator at the end of the ride which as terrifying! My brother was adamant that he was going on it, but as it was a double seater ride, himself and my husband were too heavy to go together. This left me to go with him - and let's just say that I am scared of even kids rides! But I did it. I thought I was going to die throughout, and was so scared that I literally couldn't walk to get out of the pool afterwards, but I did it. And, I would never, ever do it again! I wrote this post as a way to say that you don't always need to spend a fortune on a holiday for it to be perfect for you. And that is exactly how it has ended too. 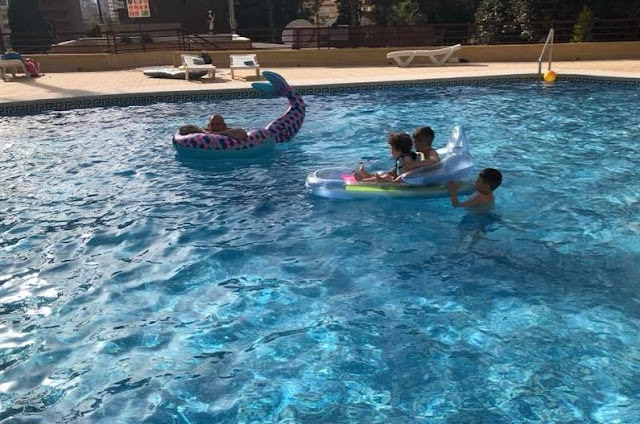 To be fully truthful, we loved our holiday so much that we are going again, next year in June - flying, transfers and apartment all the same. So as you can see, it came in well under a grand - although once we'd added travel to MAN from Leeds and food at the airport and on the plane, it was probably close to £1K. My overall tip... Do a DIY holiday. 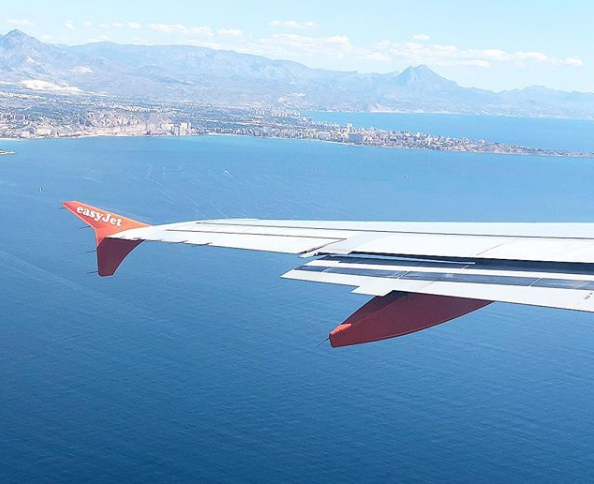 We found that it would be a lot cheaper, booking the flights direct with EasyJet, apartment through the likes of On The Beach and then transfers direct with Jumbo Transfers. What would your travel tips be? Eat where the locals eat. Better value and tastier ! have more than enough money. If the food is likely to be radically different, research dishes that they might enjoy, and try rustling up something similar before you go. Look for last minute deals you will save a fortune, If you have little ones it is definitely worth going all inclusive. I would say make sure all your passports and insurance etc. already cover the whole period when you might want to go, and then play around with timing to get the best deal. I didn't realise that deviating from the standard 7 days could save so much that a longer holiday could work out better value. What a great thing to know, thank you! Make sure you check the dates on your passport and how long the country requires - some want 6 months left on your passport so don't get caught out! Make sure you make a list of everything you need in advance - you do not want to get to the airport without the passports !! We go on a lot of city breaks, and my advice would be to stay away from the tourist areas! Amsterdam is a prime example. We use an AirBnB apartment 30 minutes walk from the centre which has plenty to do and great eating places. Ask the apartment owner about transfers. Ours told us about gogido, a taxi site that will rank all the taxi companies by price! Prepare by seeking out information from trustworthy sources. Knowing what to expect can help. Check out maps of the area. Ensure sufficient currency, etc. If a restaurant is in a tourist area avoid. Ice cream parlours are really bad, one guy tried to charge me 9 euros for an ice cream in Rome ! Read the reviews before you go and research what is around that you can do. Read the reviews abut the hotel and flights etc, Check around for all the best deals! Take enough money and the credit card for emergencies. Live like the locals and experience the "real" country you're visiting. Make sure your travel insurance offers good cover! Get your money sorted beforehand instead of paying masses at the airport and get a good credit card to take out. Always split everything up - each case should have some of everyones things so if it goes missing you have something to wear. Happy Birthday for next week :) It was my birthday 2 days ago so if I were lucky enough to win, I would definitely spend it on myself for a change! Lots of research on the place before you go. Club together with family to rent a lovely, big villa - you don't need to spend all holiday together but it means you can all afford a great place to stay. I'm not one for asking for friends recommendations on fb generally but asking for advice once you've shortlisted some destinations can be eye opening/thought provoking! 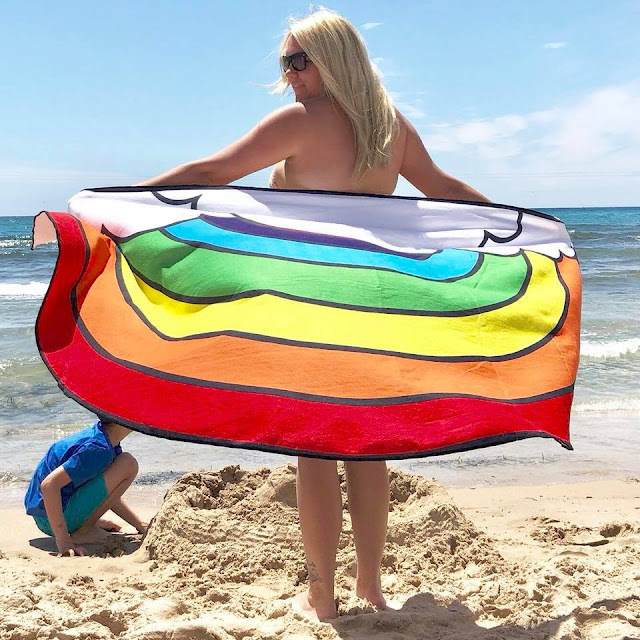 Hide any valuables inside a rolled up clean nappy when you are on the beach, nobody will want to steal that! I always look out for free family friendly places you could visit. Some museums and parks are free on Sundays. Have good travel insurance and take photocopies of all documents, passports, driving license etc, in case you lose them. Then relax and enjoy it. Take boiled sweets for the taking off and landing parts of the plane journey to help stop your ears from popping. Research and plan thoroughly. The more time spent researching the location and local area the better your holiday will be. Always remember travel insurance, just incase. Lots of research into the holiday destination. don't forget your plug adaptors! Make sure you take coffee - I drink decaf and always take some as I can never can find it!! Plan carefully and save accordingly. Do a lot of research before you go - and talk to people who have already been there if you know anyone. This can save you a lot of time and alert you to interesting places you mightn't be aware of. Make sure you have all immunisations up to date, if travelling somewhere more exotic. Even for Europe, bring children's anti-mosquito spray with you as it can be difficult/expensive to track down, ditto toddler's swim hats!. 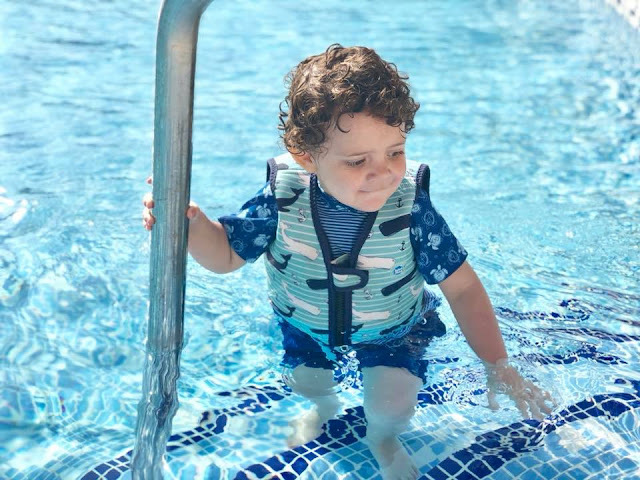 For toddlers, wetsuit style swimwear saves a lot of stress, as you don't have to chase around re-applying as much sunblock all the time, just feet/hands/face! Take a portable mobile phone charger so you can take lots of photos without worrying about the battery. If there's two of you, split the contents of your suitcases between the two, in case one should get lost. when you find the hotel you love the look of google it, see if other tour operators offer it cheaper, or better yet, check out the cost direct, we have funnily enough booked Magic Natura (staying in the resort) for next year, it was over £1000 cheaper than the lowest price Tour Operator's cost and we have a better room type than what they were offering too. Always leave more time than you think you need to get to the airport! Go off the beaten track, not the tourist traps! If you know you want to do something when you're there, book tickets before you go, that way you know you'll get in and it's usually cheaper. Don't simply do the 'touristy' things - mix with the locals and experience the authentic lifestyle of of that country. Always take some sanitary products with you like pads/tampons. They don't have them everywhere around the world! Always research hotels and activities based on reviews. Vendors tend to paint a rosy picture of everything. Some review sites can also tell you lots of insider info like best seating, room, time of day, transport options, food recommendations or discounts! Don't forget the sun cream!! Don't just stick to the tourist parts...venture out to where the locals eat and drink...experience the true place! Try to book a hotel not too far away from the airport so the transfer isn't so long. Nothing worse than a long flight then hours on a coach!! Check trip advisor before you book for reviews or any tips of what to pack. Make sure you know the exchange rate. Always take extra emergency money and make sure you are insured. Weigh your suitcase before going to the airport to make sure it isn't overweight! Eat and drink where the locals eat not in touristy places. Plan ahead and make an agenda for each day. It might sound boring, but it makes sure you see what you want to see and don't forget anything. Find the hotel you are looking for and then price independently. Don't overdo it, you can sometimes want to see everything but it is just not possible, make time for a relaxing day in between busy ones. Do research in advance and book your hotel before you go. relax and recharge your batteries that's what holidays are for. Dont completely fill your case - you'll always find something you want to bring back!! Always shop around, don't take what seems like the first great deal. Drink lots of water and use lots of sun screen. Bring your own favourite tea. Buy the right sort of cover on your trsvet insurance. Use a credit card as many places as possible! take an outfit for the kids on the plane to cope with delays and illness! Take a good first aid/medicine kit with you, it's much better to be prepared then spend a good chunk of your holiday looking for calpol/antihistamines/imodium or whatever else you might need. Check the monetary conversion before you go and make sure your credit/debit cards will work in the country you are visiting. Taking hold luggage is so expensive that my tip is to watch YouTube videos so that you can see the best way to pack and increase the space in your case. When in Rome do as the Romand do works with all countries I think. bring enough money in the right currency. Read the small print on your travel insurance, particularly for long haul destinations. Pack a bit of everyone’s things in each suitcase so if the worst happens and you loose a case; you still have some clothes packed! Make a list of stuff to pack and tick them off as you put them in the case. Take lots and lots of suncream. Red skin is not a good look. Buy your toiletries at the airport (saves on suitcase weight) you can also preorder from Boots online and collect at airport! Remember lip balm - we all remember the sun cream but we don't think that our lips burn as well! Make sure you pack medication for if you are ill. Saves time getting to a pharmacy. Always take out travel insurance, as it could prove a lifesaver when in foreign lands! Roll, roll, roll your clothes!